KENNEDY SPACE CENTER, Fla. — The first flight of a Falcon Heavy rocket with a commercial payload will have to wait a little while longer before lifting off from one of the most historic launch sites on Earth. SpaceX had been planning to send the Arabsat-6A satellite to orbit on April 7, 2019. However, the liftoff date has now been pushed back to April 9 at 6:36 p.m. EDT (22:36 GMT). 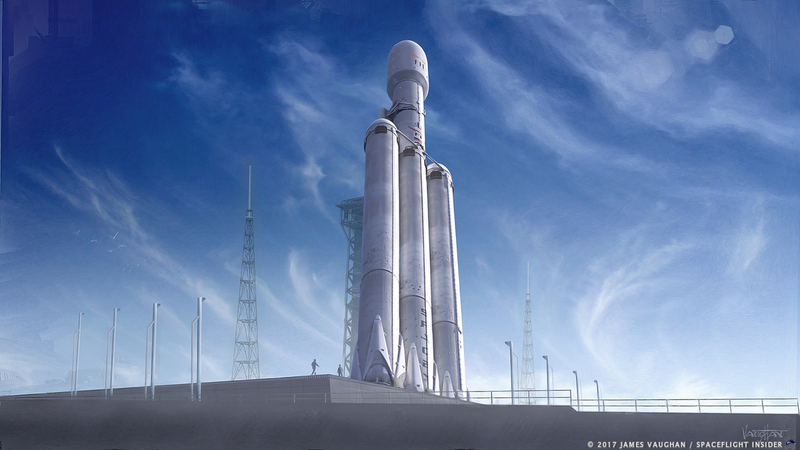 The Falcon Heavy has only been launched once before, in February 2018. When the massive rocket takes to the skies, it will begin its journey from Kennedy Space Center’s Launch Complex 39A in Florida, which is the same pad from which Apollo 11 got underway. Arabsat-6A is a Saudi Arabian geostationary communications satellite that was built by Lockheed Martin and is based off of the A2100 bus. The spacecraft is being launched to provide television, internet and phone services to the Middle East, Africa and Europe. Arabsat-6A won’t enter into a heliocentric orbit as Starman did. Rather, the satellite will be placed into a geostationary orbit as part of the Arabsat-6G program. Was there a reason given why it was pushed back? It as pushed because the static fire was pushed to Friday. Not enough time to bring the vehicle back to be fitted with payload and ferring. Direct to GEO or is it going to be deployed in GTO? I prefer the alternative spelling. BTW comments text is grey on grey on android. Will we be seeing another double booster landing?